Brittany Lewis interviewing J. Cole. Over the last few years, Global Grind has become a must-read destination for the hip hop generation looking for political and cultural analysis of current events, lifestyle and entertainment news and exclusive interviews with top musicians. If you’ve gone to the site and read any of the aforementioned music and entertainment news, chances are you’ve seen Brittany Lewis’ name on the byline. Lewis, the site’s senior music editor, handles everything from red carpet events like the BET Awards and the festival circuit to album reviews and commentary on breaking industry news. As she’s gained a name for herself, she also has a revolving door of celebrities who always take time to stop by for an on-camera chat whenever they’re in New York. Keep reading to learn more about Brittany’s role at Global Grind and what not to do when sending her a pitch. Hashtags + Stilettos (H+S): What are your day-to-day responsibilities as the music editor at Global Grind? Brittany Lewis (Lewis): My day to day responsibilities include me searching the ‘net vigorously all day. Looking for new music and new artists and writing about it before anyone else. I also interview celebrities 3-5 times a week, so I also do a lot of research about artists as well. H+S: Because you interview celebrities and get invited to the hottest events, some people may believe that your job is a party 24/7. What are some things you have to do that aren’t glamorous that most people don’t see? Lewis: That we actually work a lot! The events seem glamorous, but before we encounter these celebrities or indulge in the open bars, we work 10-11 hour days. Unlike many other people in the “industry,” the internet business is a different animal. We have to be up at the crack of dawn, because the internet isn’t about who has it, but who has it first. Lewis: Can I say never? (laughs) I hate being pitched most of the time, but if I have to choose it would be via email. Never, ever, ever, ever, ever….call me. I hate being called. It’s so rude. Especially when you’re calling me about an email you sent 10 minutes ago. Sometimes I see an email and plan on replying by the close of business, and sometimes I see an email and hope that if I ignore it long enough they won’t follow-up. The latter is usually when the artist is mediocre or downright terrible. Lewis: I’m looking for up and coming artists who have a solid fan base or following. I’m also looking for that “it” factor with artist or that thing that makes them different. There’s nothing more exciting than discovering and supporting a good artist before they become popular or mainstream. Lewis: Holidays, weekends, and late at night (anytime past 8 p.m.). Unless it’s urgent or an A-list artist, please send me a pitch during normal business hours. Lewis: There’s nothing more annoying than receiving a pitch that looks like an essay. I will not read it. Lewis: I just say honesty. Being honest with PR people about their clients or the brands they’re representing will make the world a better place. I promise. Lewis: Just be thorough with your pitches, and give me content I can build on. As a PR person you know that sometimes the artist you’re representing may be mediocre, and I understand that you’re just doing your job, but you’re not making my job any easier. When I cover artists I want to be able to believe in their talent and their art. Lewis: I’ve been writing since I was a young girl. I remember attempting to write a book when I was in 8th grade. Writing has always given me the opportunity to express myself, and I’m pretty sure people rather read my writing than hear my voice. Lewis: Keep grinding. You won’t achieve anything by resting on your laurels. I’ve noticed young adults don’t want to work for anything anymore. They want everything right away, but there’s this thing called working hard that helps you achieve your goals. I had the most fun writing or working on… I had the most fun writing an editorial piece about the first time I met R.Kelly which happened to be during an intimate listening session with a dozen other journalists. I’m most proud of… I’m most proud of everything I’ve achieved in the short amount of time I’ve been at Global Grind. I still have a long way to go, but I’m getting there. My dream interview would be with… Kanye West without a doubt. iPhone, Android or Blackberry? Used to be team BlackBerry, but I sold out two years ago and got an iPhone. I don’t want a Blackberry ever again. Sorry Blackberry. My 3 favorite mobile apps are… NextStop, it gives you real time updates and the schedules for every line in the NYC subway system, Songza, and of course I love Instagram. I have…unread emails in my inbox right now… I have 0 unread emails, but that doesn’t mean I’ve read them. I’m the person who just marks “read” on all my emails because I don’t like seeing highlighted unread emails. Emails I mark as “read” but haven’t opened I flag them so I can return them later. A fun fact about me is… Hmmm… I’m allergic to nuts, but obsessed with peanut butter. Love peanut butter. For some reason I’m allergic to all nuts except for peanuts. 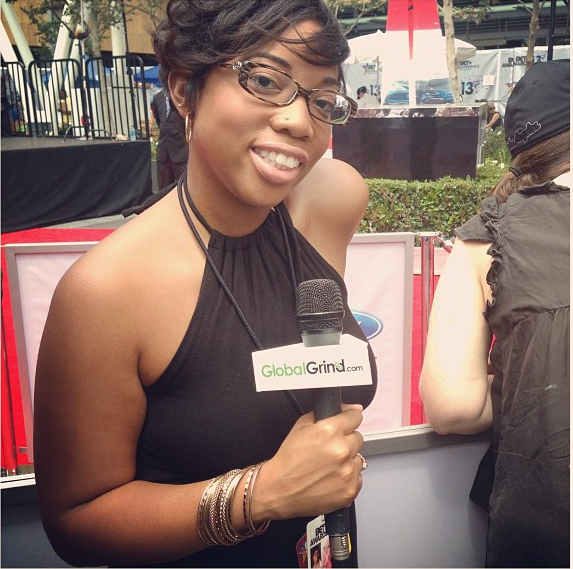 You can find me… On Twitter, Instagram and GlobalGrind.com. Read more interviews in the ‘Behind the Byline‘ series.